Plaza North is a complex with facilities designed to support lifelong learning and art activities for the enrichment of citizens. The complex includes a library, a hall, citizens interchange facilities (various ateliers, multipurpose rooms, seminar rooms, etc. 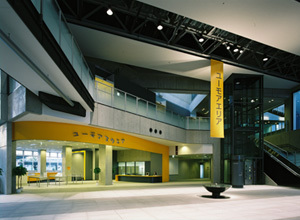 ), an art gallery and Kita Ward office. 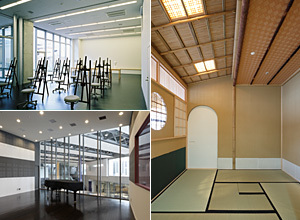 The complex is equipped with many functions which avails itself as a place of lifelong learning and cultural activities of citizens, as well as an information center for arts and culture. 9：00～17：00 When the inspection day falls on a public holiday, opening hours are as usual. 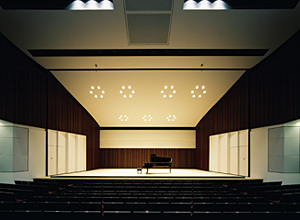 This hall with seating for approximately 400, is small, yet is a fully equipped facility where anyone can hold full-scale performances such as concerts, theatrical performances and various presentations. The close distance between the audience and the stage enables the performer and the audience to be united with one another. 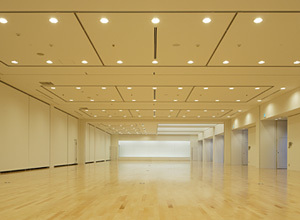 The "multipurpose room" can be tailored for various purposes such as dances, concerts, seminars, etc. Ateliers enable citizens to enjoy art in familiar forms such as ceramics, crafts, painting, etc. The 3 studios are equipped and suited for cooking, music and workshop activities. There is also a Japanese style room with a small bonsai garden characteristic of the local culture. These facilities are a hub of the interchange among the local people and cultural activities. As a locale for expression of art, this space is available for full-scale exhibitions varying from 2-dimentional to 3 dimentional art. With an area of 730 square meters and ceiling height of 4 to 8 meters, this gallery can be partitioned into 7 smaller spaces. An independent Gallery 8 has specifications suited for private exhibitions. The appealing feature of this gallery is its flexibility in meeting the needs of large scale as well as small scale exhibitions. Plans are also underway to hold annual exhibitions to introduce modern art as part of a municipal project. Humor Square has its origins with Rakuten Kitazawa (1876～1955), the forerunner of modern Japanese comics who resided in Bonsai Township in the old Ohmiya City. In this square, works collected from the municipal culture project called the Humor Photo Exhibition, which introduces "humor" from various interesting angles, are displayed. Also displayed are works from the Citizen's Comic Exhibition, International Comic Exhibition, enabling citizens to get acquainted with "humor" in an understandable way. Connected to this square is a free reading space and projection room, where 2000 comics and humor related publications can be read freely This space is normally open with the main square. In addition, screening of films from the collection is scheduled to be held. *Subject to closing when facility is under inspection.